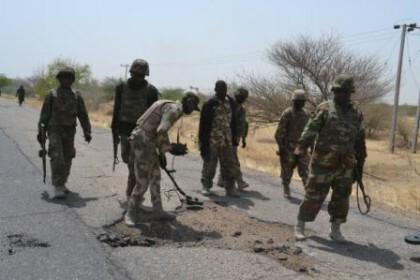 Nigerian troops have cleared the Damaturu – Biu road littered with mines by insurgents. 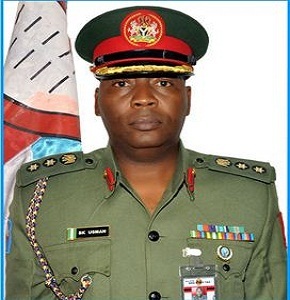 A statement by the Acting Director, Army Public Relations, Colonel Sani Kukasheka Usman says the road was cleared by a team of Nigerian Army Special Forces, Explosives Ordinance Devices with support from the Nigeria Police and members of the local vigilance group. Boko Haram has been earlier reported to have blocked the Damaturu-Biu road, raising fears among Nigerians. The Army spokesman noted that four improvise Explosives Devices (IEDs) planted by suspected Boko Haram terrorists were discovered and detonated successfully during the painstaking operation. He enjoined commuters to use the road as adequate security has been provided. The statement further advised the public to be security conscious and report any suspicious persons and movements to security agents.